Easily upright your bike when needed! 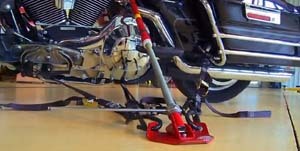 A new, innovative jack has been developed to help upright large, Harley Davidson Touring and Softail motorcycles. The Over & Back-Up Jack is an industrial power screw and nut drive assembly that provides a compact means for transmitting power and motion. 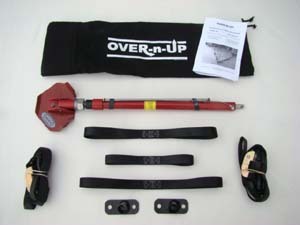 The hook-up arrangement creates a pivot point so that when the power screw is rotated, a pushing force cooperates with a pulling force that will position and hold a bike at a desired lean angle. Made of aluminum and steel and weighing about four pounds, the Over & Back-Up system fits right into the bike’s saddlebag and is maintenance free. 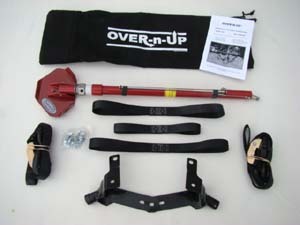 With practice, the process of uprighting the bike can be completed in about three minutes. The jack is a completely American-machined product that carries a limited lifetime guarantee. It uses industrial power screw components with precision machined and laser cut related parts for extreme reliability. Note: DISREGARD THE WELD-ON FRAME ADAPTER APPLICATION MENTIONED IN THE VIDEO. 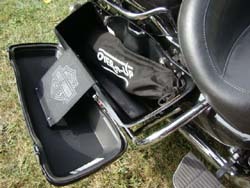 WE NOW OFFER BOLT-ON ADAPTERS FOR MOST HD RUBBER MOUNT TOURING, AND SOFTAIL MODELS! 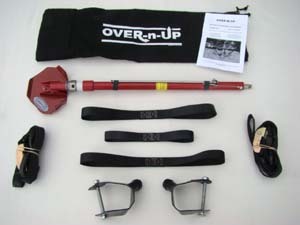 The Over & Back-Up system is simple, safe, reliable and easy to use. 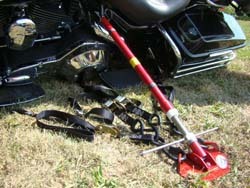 This jack is perfect for safely righting a fallen HD® Touring or Softail Family Motorcycle, and for safely leaning it over to access underside for cleanups or service - no matter what path you go down, or down on. 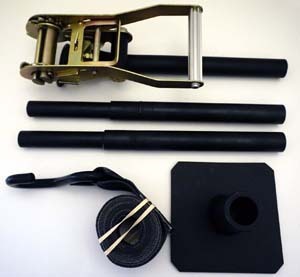 Detailed instructions include: frame adapter install, hook-up and operating procedures. Fits 1980 to current model years bike, including the Project Rushmore and Milwaukee 8 years. MBJ-01: When your bike falls over there are all types and styles of techniques to manually lift the bike back up to an upright position. All these techniques could offer strain and injury to the untrained or weak rider, just the wrong push can easily strain your back requiring medical care or at very least pain control drugs for days. 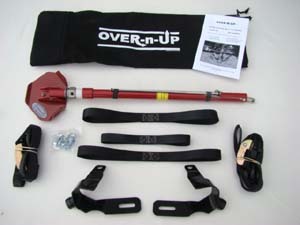 There is a better and easier way to lift your bike without risk of injury. 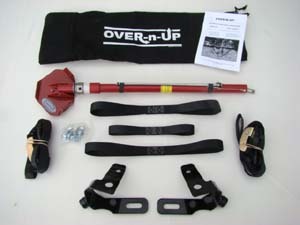 In less than 5 minutes you can have the lift assembled, bike lifted and be back on the road. 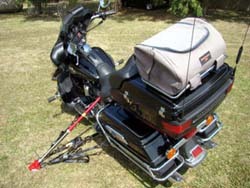 The MBJ-01 conveniently stores on any bike, either in the luggage or strapped on, the whole unit packs down to just 13 inches by 5inches and weighs 7.5 lbs. 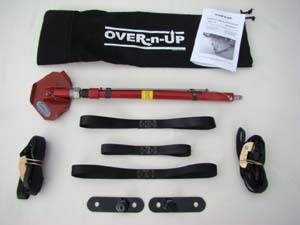 The Unit consists of a flat base that will stabilize the jack on gravel, dirt, sand and mud- two reinforced steel shafts connected to an upper lift ratchet. 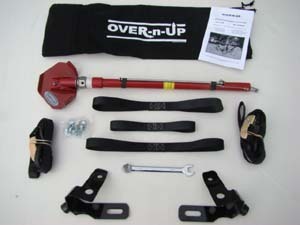 The Ratchet has a rating of 3,300 lbs. able to easily lift a 1000 lb. Motorcycle. Proudly Hand Made In USA of American Steel. 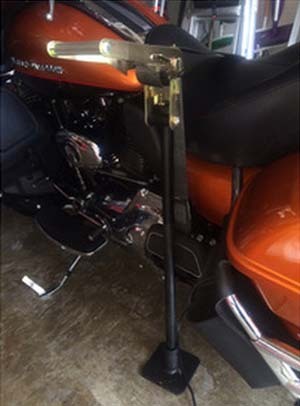 The connection point is a Vinyl Clad S hook that will attach to a lower frame section, rider peg or passenger peg.